Amphenol RF has released the SMA Quick-Connect adapter, a straight jack to straight plug configuration, as part of a wide portfolio of coaxial adapters. This precision machined 50Ohm adapter allows quick and easy mating with all current threaded SMA jack and plug connectors. The adapter simply converts any standard SMA Plug test cable into a Quick-Connect cable without compromising the electrical integrity of the assembly. 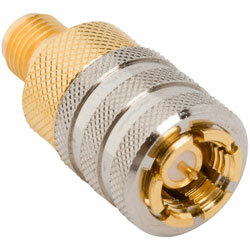 This adapter supports the same high-quality coupling that buyers expect from a threaded interface. Also, the unique push-turn thread on, pull off style of coupling used by this SMA adapter need no tooling for mating or unmating. Using this adapter together with an existing SMA Plug test cable decreases the time and effort required in the testing process while at the same time increasing the life expectancy of the test cable.